Pittsburgh Underground: Movies That Have Everything: Desperate Living At Hollywood Theater THIS SATURDAY!!! Movies That Have Everything: Desperate Living At Hollywood Theater THIS SATURDAY!!! Calling all deviants! 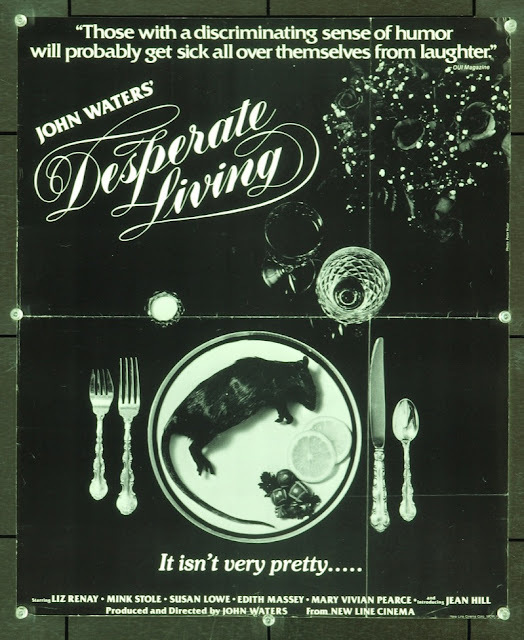 The classic John Waters comedy Desperate Living is coming to the Hollywood Theater this Saturday starting at 10 PM for only $7 a pop!!! What?! You've never heard of this gem from 1977?! The story centers around neurotic Peggy Gravel (Mink Stole) and her overweight maid Grizelda Brown (Jean Hill) who skip town after smothering Peggy's husband. After being arrested by the cross-dressing cop played by Turkey Joe, they are given the ultimatum of either going to jail or being exiled to Mortville - the shantytown ruled by the evil Queen Carlotta (and played by the legendary Edith Massey) and her daughter Princess Coo-Coo (Mary Vivian Pearce). Check out this old school trailer! Didn't that make you feel like a kid again? Is your soul smiling from the inside out? It makes us want to fart rainbows! Remember kids - this is a ONE NIGHT ONLY event so lock the kids in their room and plan a date night to the Hollywood Theater!!! Trust us, you won't be sorry!